“PRESTO” is a Norwalk Island Sharpie trailer-sailer (NIS 26) designed by the renowned designer Bruce Kirby who designed the Laser and many other successful sail boats. She has been setup for single-handed sailing and for extensive coastal cruising. Considering offers around $42,000, ready to sail. Sail inventory: Tan mainsail with full-length adjustable battens and cover. Three reef points Outhauls, leech adjustments halyard and vang to cockpit. Tan Mizzen sail with full-length adjustable battens and cover. Two reef point back to cockpit. Outhauls, leech adjustments and vang. Mast/Rigging: Both Main mast and Mizzen are spun aluminium and are un-stayed. Both fit to aluminium tabernacles. Booms and sails remain in place when masts are lowered. Raising main is accomplished with self-tailing deck winch. Mizzen raised by hand. Raising and lowering both masts can be carried out with ease by one person. Deck gear: Centerboard is raised using stainless steel hand winch in cockpit. 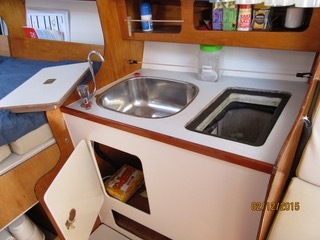 Reefing lines run back to Easy jammers on cabin top. Vang, outhaul and main sail halyard return to Easy jammers on cabin top. Harkin self-tailing winch for main halyard, vang and mast raising. Deck operated hand bilge pump. 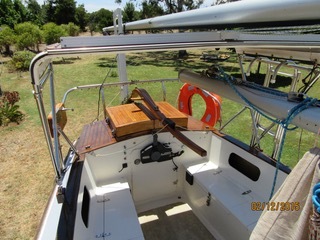 Tiller steering with vertical raising/lower rudder. Lines for self-steering. Bimini over rear cockpit to hold solar panels. Trailer: 2600 t Fully galvanised duel axle electric braked. New tyres and bearings with 2 spares, LED trailer lights. Full rollers with electric winch. Well balance proven long distance towing trailer. 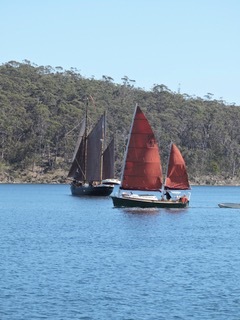 (Has trailed boat from Brisbane to Hobart, Busselton W.A. to Hobart and to Carnarvon and returned with no incidents). Tender: 10Ft Folda Boat with 3.3 Hp Mercury 2 stroke &amp; pushput motor bracket, may be available for separate purchase.